“Make your dreams come true for a night, a week-end or a week…” this is the concept the team of Château Gauthié will give to their clients! People can choose between two different solutions: a bed and breakfast for two people or a self-catering in the trees for different people. The first could be reach by charcoal stairs one has been built on an oak tree, a tree goes inside the house and their branches come out of it, as arms from a human body. Everything inside and outside is made of wood, so that the house camouflages itself with the surroundings and nature. From a balcony, the clients can just chill or having their breakfast, while inside can have all the comforts: a double bed, a little table and a bathroom with a shower too! 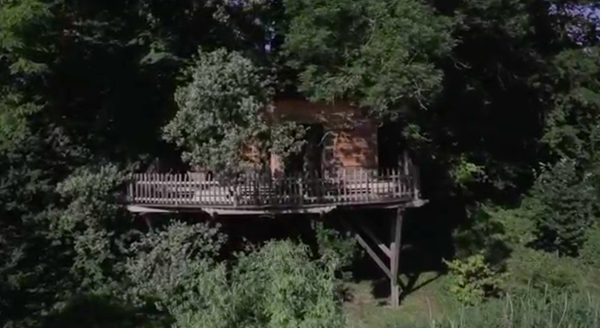 The second solution is a treehouse five meters from the ground with a view on the lake. This treehouse too is made all of wood, inside and outside, but bigger than the first one. A kitchen-dining room where the trees enter it, are the main rooms, there are also two bedrooms: one with a double bed and one with three single beds and finally a bathroom with shower and heating. A big balcony is in this treehouse too, with a table where people can eat or just sit looking at the lake and two chaise longue where people can relax, read or sleep listen the sound of nature. Take a look at this video and if you need further information or book just visit Château Gauthié website!